Yesterday I performed the holy ritual of moving to a new apartment, which means that my body is sore and there’s unassembled furniture everywhere. Also, I don’t know what to do with my old video games. While unpacking boxes yesterday, I dug up a bag full of PS2 and Wii games that I haven’t touched in at least a decade. They’ve just been sitting there, unplayed, as I upgraded to bigger and better consoles. Soon enough, the PS3 and 360 games will join them. Such is the cycle of a video game industry that moves in generations, leaving history behind like the vegetables in the back of the freezer that I hope my old landlord doesn’t discover. Now I have many questions. Is it worth hoarding this stuff for sentimental reasons? 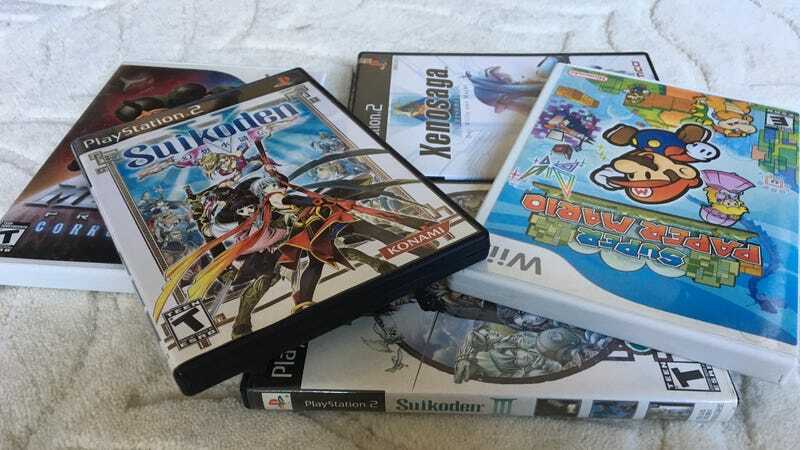 Would it be a sin to throw away Suikoden V, one of my favorite games of all time? Should I keep all of my old games in case I get the urge to hook up the PS3 one day and revisit Metal Gear Solid IV? What if Super Paper Mario for Wii becomes a $5,000 collector’s item? Or should I just throw them out? Unlike my good buddy and Kotaku features editor Chris Kohler, I’ve never cared much about maintaining an extensive collection of retro games. I’m the type of guy who will rebuy old games on new systems just to avoid the hassle of untangling wires. When storage space is limited, what do you do? I live in Manhattan, so just shoving them all in the basement isn’t an option. Should I feel guilty about throwing away all these games I used to love? Or should I just let go?